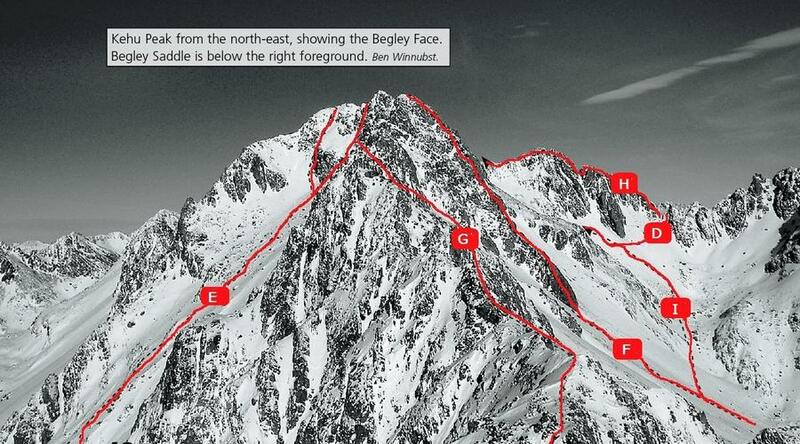 All routes reached from the Begley and Rainbow valleys are steep, and probably best done as spring snow or ice climbs. This magnificent peak has some of the best climbing in the park, with nice rock on the normal summer route, and more difficult winter and spring climbs. It is the only major Travers Valley peak visible from Lake Rotoiti, and is named after Thomas Brunner’s Maori guide Kehu (or Ekehu) without whom his epic 18 month journey from Nelson to Paringa would have been impossible. Via Begley Ck. The face is split by an obvious hanging gully, very steep at the bottom, then at an easier angle to the short ridge joining the north and south summits of Kehu. In October the steep bottom of the gully is one pitch of consistently superb plastic ice, about 75º. Magnificent. Via Begley Ck. To the right of the steep gully (South Face Gully route) is a shallow steep gully. Angle up to the top edge of a steep snow-covered slab. Traverse the slab a short distance (very exposed) or crawl under a small rocky overhang onto easier slopes, topping out on the south summit. Via Begley Ck Climb around the toe of a buttress and into a wide easy gully on the western side of Kehu. Look for an obvious gully on the right, walled by steep rock. The gully snakes up and tops out above the buttress, beside two shark's teeth shaped rocks. Traverse across and into the hanging gully of South Face route . Alternatively, climb to the ridge above, from where it is possible to descend onto upper slopes on the Travers side (see Travers Face Route & West Face routes). Other ice gullies on this face have yet to be explored. Via Begley Ck. The wide gully of West Face route leads to the ridge between point 2096m and the summit. Descend on the Travers side and sidle steep slopes or a gully to the peak. Keep mostly on the true right of the west branch of the Begley, through bush into an upper basin. Climb easy slopes and at map ref. N30/902080 cross a spur into a hanging valley north-east of the peak. A narrow gut at the head of the valley, to the right of rock bluffs, tops out just north of the summit. Alternatively, snow slopes to the left of the bluffs lead to a gully, which tops out just south of the summit. From Upper Travers Hut, climb tussock and scree to a wide shelf. Sidle south then ascend a major scree basin under Kehu to the steep firm rock of the face. There are several routes onto the rock face (e.g. via a short gully on the lefthand edge) leading to the range above and then a scramble south to the summit. J Stanton, J Taylor, R Lamberton, L J Dumbleton, April 1947. A traverse of the divide from Begley Saddle is long. 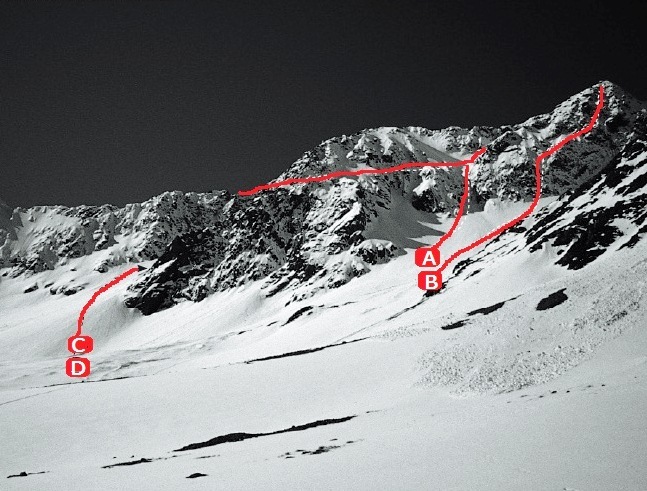 A sharp rock fin requires cheval tactics then the ridge rises in steps. From a shallow col descend west to North West Face route. Via Travers Valley. The south-west head of the scree basin in route 5.12 leads to slabs and ribs under a low point on the divide. The spiky and difficult ridge rises steeply to the summit. Via Travers Valley. Follow the basin in the West Ridge route south, around the toe of the north-west face, to where a steep and rotten gully (good ice in winter) gives a route to the divide immediately north of the summit.